Whole Grain Wheat, Sugar, Corn Syrup, Salt, Distilled Monoglycerides, Annatto Extract Color. BHT Added to Preserve Freshness. Vitamins and Minerals: Calcium Carbonate, Vitamin C (Sodium Ascorbate), Zinc and Iron (Mineral Nutrients), Vitamin E Acetate, A B Vitamin (Niacinamide), A B Vitamin (Calcium Pantothenate), Vitamin B6 (Pyridoxine Hydrochloride), Vitamin B2 (Riboflavin), Vitamin B1 (Thiamin Mononitrate), A B Vitamin (Folic Acid), Vitamin A (Palmitate), Vitamin B12, Vitamin D3. Food allergic consumers. 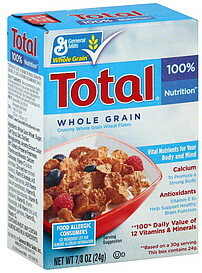 Contains wheat; may contain almond and milk ingredients.